← To Be Or Not To Be? 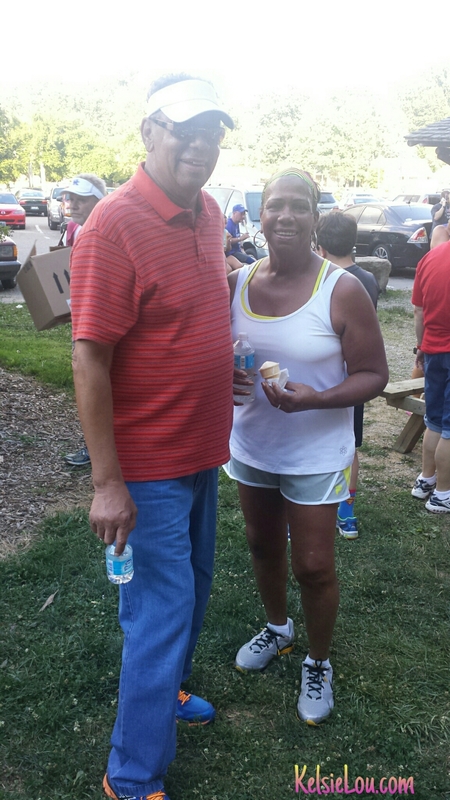 The Iroquois Hill Runners were back at it with their Annual Ice Cream Social 5K. The course consisted of a loop around the ever so hilly Iroquois Park. Awards? All you can eat Ice Cream! I did not plan to race this event because I went all out in my 5:15 a.m spin class. We have optional floor work of planks, wall sits, burpees and squats. Recently, we incorporated a military style push up by making sure our chests hit the floor. This technique had my arms sore all day. Plus, I had 6 miles to run the following morning. Besides ice cream and beautiful weather, I was excited that my parents would be joining me! My Mom made it clear to my Dad that once she got warmed up, he would be on his own. We headed to the start line after paying our $3 race fee. The crowd was four times larger than the Pizza Run. I gave my parents a last minute tip of making sure they stayed on the inside edge of the counter clockwise loop. I wasn’t paying attention and missed the official start. That made me take off fast from the outside edge and break to the inside. My first mile split was 7:22. There was some downhill action that I told myself is “getting my reward.” I learned that phrase from my spin instructor, Paul. It helps me run hills with less fear and more “I gotta get this done to get to the other side” mentality. My 2nd mile split was 7:55. I was going through a series of turns and uphills at this point. I skipped the water station and had to weave around non racers going the opposite direction. I linked up with a teenager who was handling the hills like a champ. By the time we made it to 2.5 miles, we were neck and neck. So much for not racing. My 3rd mile split was 7:10, and he beat me by a stride. My final time was 22:32. This was almost a minute faster than my time for the Pizza Run of 23:24! The official times are not posted, but I believe I was top 3rd-5th overall woman. I grabbed a water and a vanilla ice cream cone. Happy feeling. I started walking back along the course to find my parents. I saw my Mom and helped her finish. She jogged a little but mostly power walked. She crossed the line at 48:00 and some change. My Mom thought my Dad had turned around and gone back to the start. She saw him talking early in the race and kept it moving. He loves to talk! I had to go back on the course to find Big Phil. I was relieved to see him taking his time and making his way towards the finish. He was holding a water bottle. Knowing him, he probably held a conversation at the water stop about Dasani being on sale for $1.99 a case this week in Walgreens. He loves his coupons!! I signaled to the race director that my Dad was coming through. Dad said there was another lady behind him. I think he may have mistaken a regular park goer as a participant. I was glad he and my Mom conquered those hills. At ages 70 and 72, I believe they were the oldest participants. My Dad finished around 53:00 and there was no more ice cream. I offered him a scoop of Comfy Cow from across the street. He declined stating they had more than enough at home. Another race down in the books! 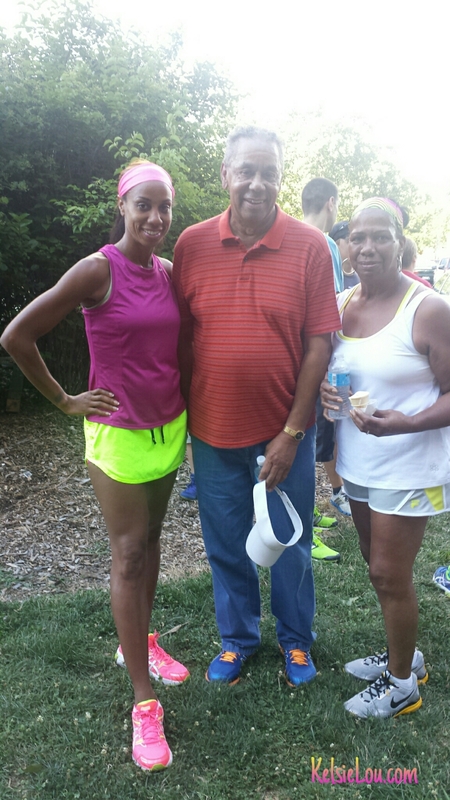 This entry was posted in family, fitness, Louisville, running and tagged 5k, Iroquois Hill Runners, Iroquois Park. Bookmark the permalink. Thank you Cynthia! 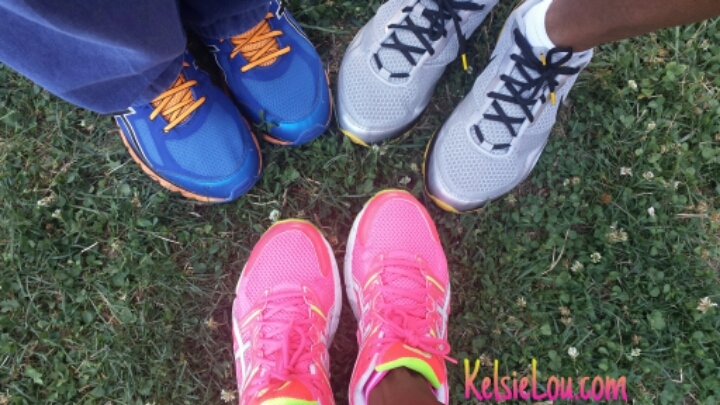 It has been my goal for the 3 of us to complete a 5K. I really wish I could “play” more with my family. I get to do one race with them each year…and it’s the Making Tracks for Celiacs. Not going to lie…my dad bandited that one, but my mom walked it. You are, as always, amazing!! I hope to channel your speed this summer and learn so much from you. I think training together will be a win-win for both of us! I see a huge improvement from last summer already! From your lips to God’s ears. I keep thinking I’m not where I was…then Cathy keeps telling me I PR’d my last three races. You BQ ‘ed your 1st marathon! God is listening!! Nice job! I cannot help but race a race! Even if I workout earlier in the day (which I probably will do) And way to go Ma and Pa!!!! I hear ya! Thank you!! Remind me to take pics before I race lol! Aw! Love this post! Love that your parents joined you. Thanks for sharing! Thank you, and you are more than welcome! As you can see, I am very close to my parents and I dread the thought of them no longer being here.